Admired for centuries as a symbol of true love, the beauty of a single red rose has been replicated in these stunning crystal rose favors. Our red multi-faceted crystal rosebud blooms atop a chrome finish silver metal stem with outstretched leaves. 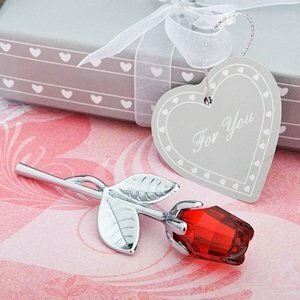 Each measuring 3 1/2" by 1 1/8", the crystal rose favors are presented on a pillow of white satin inside a Choice Crystal signature silver gift box with heart design, white organza and satin ribbons, crystal heart charm and heart-shaped "Thank You" tag. NOTE: Due to California regulations, we are unable to ship this item to California. If shipping address entered is in California, order will be canceled. I was able to order a tag for the roses but I don't see that option now. Unfortunately, the Choice Crystal Red Rose Favors can't be personalized but you can order a separate tags here.